20x24mm steel rose gold PVD 5N case, 50 white diamonds 0.35Cts, black dial, steel black PVD cable, Swiss movement. 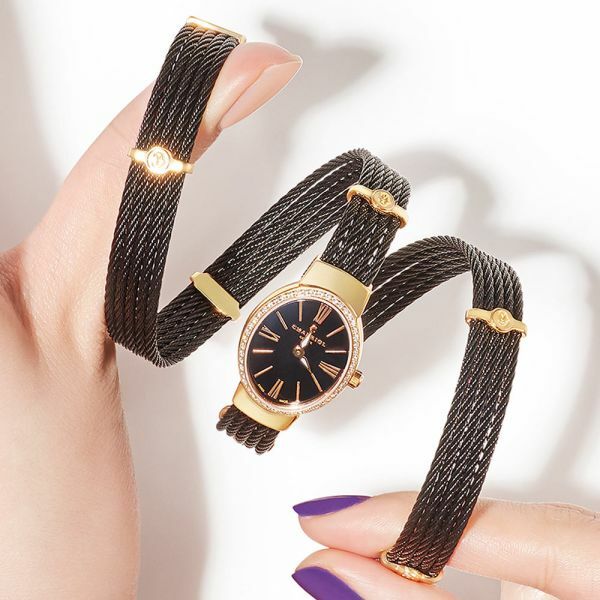 Feminine and dressy, the TWIST watch by CHARRIOL makes a regal statement with its double-twist bracelet featuring the Maison’s signature twisted cable. 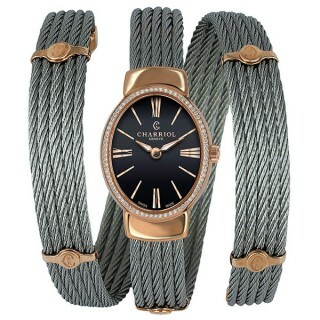 Charriol's TWIST watch: the ultimate timepiece for the modern woman, with diamond decoration on the rose gold-plated case. Exemplifying Charriol’s fun aesthetic and quality craftsmanship, the serpentine Twist watch is a beautiful and contemporary timepiece. 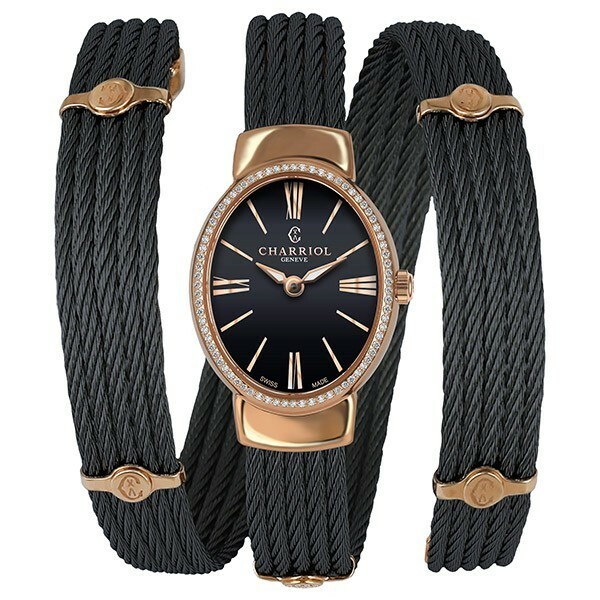 Our signature stainless steel cable strap in black has been embellished with rose-gold PVD end pieces and dainty clips bearing the ‘C’ insignia and wraps luxuriously around the wrist. The case, plated in rose gold, boasts diamond decoration, a black dial, domed glass and a Swiss-made quartz movement. 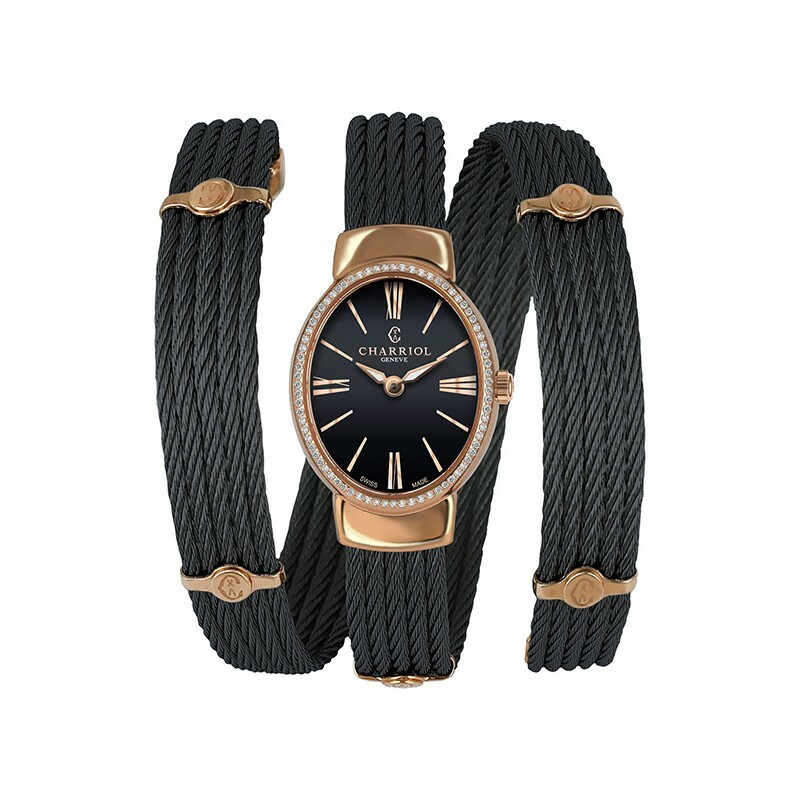 Ideal as a formal accessory, it is as versatile as it is beautiful, and will add timeless sophistication to any work, leisure or evening outfit. With such a bold personality, this watch is best worn alone.